Roulette is said to have begun in France in the 17th century and the invention of the modern wheel is attributed to French scientist Blaise Pascal. It wasn’t until 1842 that the first zero was actually added to the wheel, this addition giving the casino a house edge for the first time. So, in a way, French Roulette is the oldest type of roulette game. The game spread worldwide, and casinos in the US added another zero to increase this house edge. Modern French roulette does still feature the single zero. There are other advantages to the game that make the house edge even lower, thought to have come about because the French public thought the edge was too much in favor of the casinos. The wheel features 37 numbered slots which include all the numbers from 1 to 36 and a green 0. The numbers alternate from red to black as we move around the wheel. Interesting Fact: If you add all of the numbers of a roulette wheel together they total 666 – the number of the beast. This is why roulette is said to be “the devil’s game“. French Roulette is similar to other versions of roulette, but it allows special bets that you won’t find anywhere else. French Roulette is a bit more complex than American or European Roulette because some of the potential wagers are many-bets-in-one. Not all of the French Roulette wagers are intuitive, but they offer new betting options that keep the game fresh and exciting. For the jaded roulette player wanting a new challenge, French Roulette is the next variation to learn. The step-by-step guide to playing French Roulette below discusses a typical betting round. Wagering is similar to the bet sequence in European Roulette, but players are allowed to make announced bets (sometimes named “called bets”), if they place enough chips on the table to cover the bet. In a live casino setting, familiarity with the betting terms helps a gambler communicate with the croupier (dealer) better. Place bets on the layout – which looks a bit different than a European Roulette layout. Familiarize yourself with the French words for the bets. For example, Passe for Even and Impair for Odd. Players only need to learn six words for the even-money bets, so you’ll pick up the terms in a few spins. Make announced bets by calling out the type of bet. For example, Tiers du Cylindre, but remember to place enough chips on the table to cover the wager. The reason announced bets have their exotic names is to make it easy to announce the bet at a moment’s notice. Once again, familiarize yourself with about a half-dozen French phrases and you’ll know how to make announced bets. If you choose the full/maximum or full/complete bet, remember it’s 12 different bets in one. For that reason, it’s much easier to announce this bet, so call out the full/maximum number you want. If you were betting the full/maximum on the number seven, you would call out “Complete Bet on 7” or “7 to the Maximum” to the dealer. The croupier shoots the ball into the cylinder, calling out “No More Bets” when the ball begins to drop into the wheel. The dealer’s word is final on late bets or announced bets, so do not argue if your late bet is overruled. The winning number is determined when the ball falls into a pocket. The dealer collects chips from losing bets first. This leaves only the winning bets on the table. Next, the winning bets are paid. French Roulette has many different winning combinations, so multiple players receive payments. Important: Even on winning bets, do not touch chips until the croupier pushes them your way. As you can see, French Roulette’s called bets are a little complicated at first but are worth the trouble to learn for high rollers and serious gamblers. 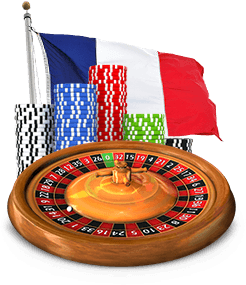 Playing French Roulette online helps you learn the game before playing live roulette, so you have a feel for announcing your bets. After signing up to most online casinos, American and International players can bet on French Roulette online. US Players: Bovada is our recommendation. Global Payers: Betway is our pick. In casinos nowadays, Live Dealer French Roulette is becoming more popular. Playing live dealer French Roulette allows you to talk with a real-life croupier, instead of using virtual roulette simulations. Casinos with live dealers stream videotaped roulette spins to your screen in real time. This allows you to play French Roulette the way it is played in a brick-and-mortar casino. In French roulette, you’ll find all of the standard betting options that you’ll find at any wheel around the world, as well as some extra bet types. You’ll also find two other rules which are specific to French roulette. Here we explain all of the bet types you’ll be able to place in the game, finishing with an explanation of these specific rules. Tip: You’ll receive higher odds the fewer numbers you cover – a straight bet offers odds of 35 to 1, whilst a corner bet covering four numbers offers lower odds of 8 to 1. Voisins du Zero – This translates to neighbors of zero and represents all of the numbers between 22 and 25 on the wheel. You’ll bet nine chips on a combination of splits, corners, and trios on these numbers. 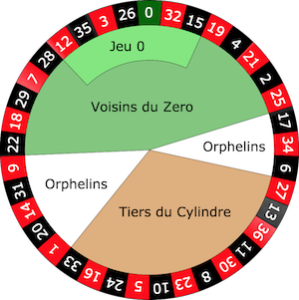 Le Tiers du Cylindre – This translates to thirds of the wheel and represents the numbers opposite zero, the range being the twelve numbers from 27 to 33. This bet costs six chips as you’ll be placing six split bets to cover these numbers. Orphelins – This translates to orphans and represents the eight numbers outside of the previous two bets. This represents eight numbers and will cost five chips, which will be four splits and a single additional chip on the number 1 slot. You’ll find either of the following rules at a game of French roulette. En Prison – This rule comes into play when the ball lands in the zero slot and you’ve placed a bet on an even money chance, such as red/black or odd/even. Use this rule and your stake will remain on the table for the next spin. If your bet lands in the appropriate slot, your stake will be returned. La Partage – Similarly to the En Prison rule, this applies again when the ball lands in zero when you’ve bet an even money shot. In this case, you’ll receive half of the stake back. The house edge varies in French roulette depending on the type of bet you are placing. The edge is 2.70% when betting on any non-even money shot, but it lowers to 1.35% for the even money bets. This is very favorable in comparison to other casino games. American roulette, for example, has a 5.26% edge for the casino. Tip: If given the choice, we recommend choosing French roulette over other versions. Picking the right casino for live French Roulette is important because you’ll receive better deposit bonuses with more advantageous wagering requirements. Not every live dealer casino offers a wide range of bet limits, so you’ll receive the betting limits you want. The live dealer casinos we recommend have a better game selection and friendlier, more attractive dealer than much of the competition. New game variants go live all the time, BetOnline just added Super6. Live French Roulette is not offered by BetOnline Casino at the moment, but it does offer the next best thing: Live European Roulette. Several roulette games are offered at one time, so you can choose the bet limits you prefer. You could also be featured on the Roulette leaderboards of the casino. Bet limits: BetOnline’s Live Casino limits are currently between $1-$100, $5-$500, and $25-$5000, so high roller roulette players get the adrenaline rush they seek. Welcome Bonus: $25 Live Dealer Casino Free-Play Bonus & up $3,000 over first 3 deposits. Global players can indulge playing French Roulette with a Live Dealer at Betway. The live dealer casino provider is Evolution Gaming – considered the best in the business by many. Some of Betway’s live casino games are streamed live from London’s Hippodrome Casino, so you get an immersive experience while playing. Bet limits: Betway Casino limits are currently £2 to £100,000. This and their bonus allows players to clear the wagering requirement while playing live dealer French Roulette. Welcome Bonus: Live Dealer Casino Deposit Bonus & up to $1,000 Welcome Bonus.